What type of neurotransmitter is used by the pathway shown in the figure? Which of the following is a type of slowly adapting touch receptor? What layer of the skin contains the cold thermoreceptors? Which of the following are proprioceptors found in the articular capsules of synovial joints? Which of the following types of neurons conduct impulses from the thalamus to the primary somatosensory area of the cerebral cortex? Which of the labeled structures in the diagram is a pain receptor? 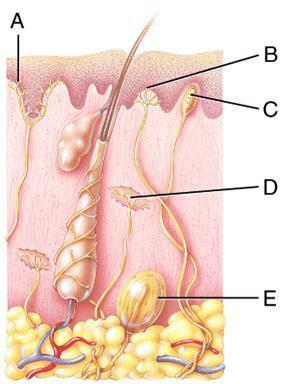 Which of the labeled structures in the diagram represents a type II cutaneous mechanoreceptor that monitors the stretching of skin? Which labeled neuron conducts impulses from the thalamus to the primary somatosensory area of the cerebral cortex? Which of the labeled structures in the diagram of the trigeminothalamic pathway is the trigeminal ganglion? Which of the labeled structures in the diagram of the trigeminothalamic pathway is a second-order neuron? Which of the following is a direct motor pathway? Which of the following is an example of a specialized sensory receptor cell that is known as a “separate cell”? Visceral pain coming from the stomach is referred to which location(s) in the diagram? Visceral pain coming from the ovaries is referred to which location(s) in the diagram? Which disorder is characterized by a person’s breathing repeatedly stopping for 10 or more seconds while sleeping? Which of the following stages of non-rapid eye movement (NREM) sleep is considered the deepest level of sleep? Which of the following types of cells display the property of electrical excitability? This type of neuron has one dendrite and one axon emerging from the cell body. makes the membrane less polarized. An excitatory neurotransmitter _____ the postsynaptic membrane. Which of these types of channels is involved in leaking sodium and potassium ions across the membrane in order to establish the resting potential of a cell? Which of the following types of neurons is the most common type of neuron found in the brain and spinal cord? Which of the labeled cells in the figure is NOT a neuroglial cell? Name the type of membrane channel that opens in response to touch, pressure, vibration, or tissue stretching and is found in the auditory receptors of the ear, and in touch and pressure receptors in the skin. degeneration of the distal end of axon and myelin sheath after neural injury. In the process of spatial summation, _____ are added together and _____ are subtracted from that total to determine whether _____ will be created at the trigger zone of the postsynaptic neuron. Which layer of protective connective tissue is the outermost covering surrounding a spinal nerve? A man presents with median nerve palsy in his left hand. What is the most likely site of injury? Which type of descending motor pathway originates in the brainstem and governs automatic movements that help regulate muscle tone, posture and balance? Where is the subarachnoid space? Where is the pia mater? Which of the labeled structures carries exclusively motor information away from the spinal cord? Which of the following structures is labeled B in the diagram? 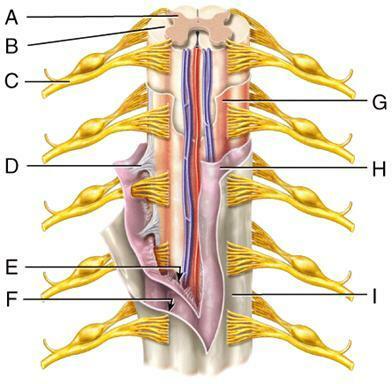 The structure labeled A in the diagram belongs to which group of spinal nerves? Which of the following nerves is labeled A in the diagram? 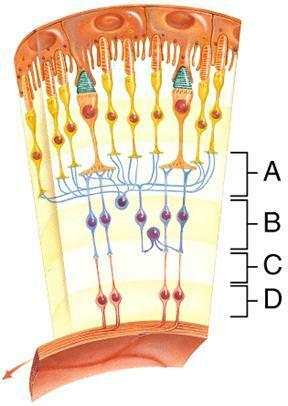 Which of the following nerves is labeled B in the diagram? A severed obturator nerve will lead into paralysis of which region of the body? The brain and spinal cord develop from the _____ neural tube. Which of the following is a narrow fluid-filled cavity found along the midline superior to the hypothalamus and between the right and left halves of the thalamus? white matter protrusions found on the medulla oblongata. Which of the following is a nucleus found in the medulla oblongata that receives sensory information associated with touch, pressure and vibration? Which region of the brain serves as the major relay station for most sensory impulses that reach the primary sensory areas of the cerebral cortex from the spinal cord and brain stem? the gray matter grows faster than the underlying white matter. 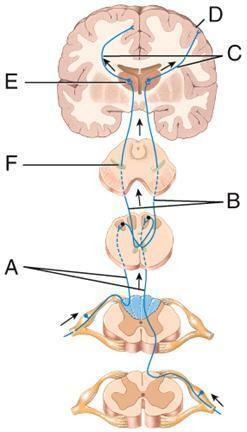 Which of the following cranial nerves control movements of the eyeball? 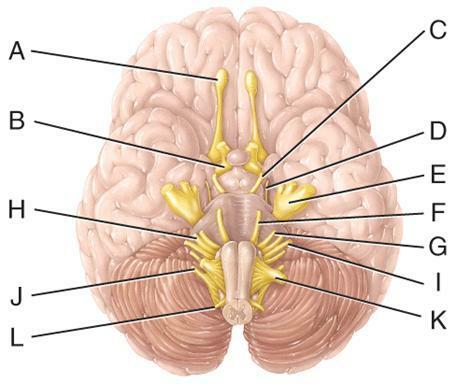 Which of the following cranial nerves is primarily responsible for changing facial expressions? Which cranial nerve in the diagram is primarily involved in the sense of vision? Which cranial nerve in the diagram has a somatic motor function primarily involved in chewing? neurons in the cerebral cortex. Which three areas of gray matter found in each cerebral hemisphere are important in helping to control the initiation and termination of skeletal muscle movements? to sense changes in muscle length. What category of receptor cell is used to sense touch, vibration and pressure? Which is NOT considered an accessory structure of the eye? Which is the correct order in the flow of tears? 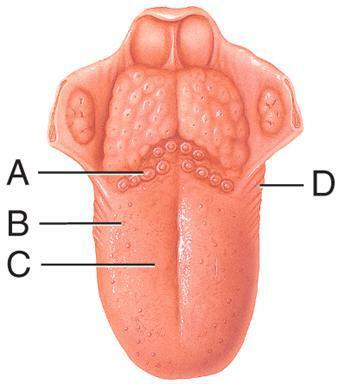 Which of the labeled papilla houses 100–300 taste buds each? Identify the ganglion cell layer. Which labeled step(s) represents regeneration of active photopigment? Identify the structure that is a thin semi-transparent partition between the external auditory canal and the middle ear? From which of the following layers of the developing embryo do the eyes initially develop? progressive loss of hearing in both ears. Which sensory structure in the inner ear is capable of sensing rapid rotation of your head to the left? Study the picture below. Which NERVE potential travels the longer distance in a typical sensation? Carefully study the diagram below.. Which statement best describes the direction of signal transmission? Which is NOT a sensory function of the nervous system? Which neural circuit enables a single presynaptic stimulation to cause a postsynaptic cell to send a series of impulses? Which cells are ciliated and function to move CSF? In this experiment, what was the approximate membrane potential when the action potential was generated? Which type of depression results in an individual with a manic-depressive illness.